USN Nutrition are forever adding to their range and now they’ve brought out a 1 litre mega shaker which is perfect for any gym goer. USN Nutrition Mega Shaker allows you to have any kind of protein of any kind of serving size without any problem at all. There’s always plenty of room for water. 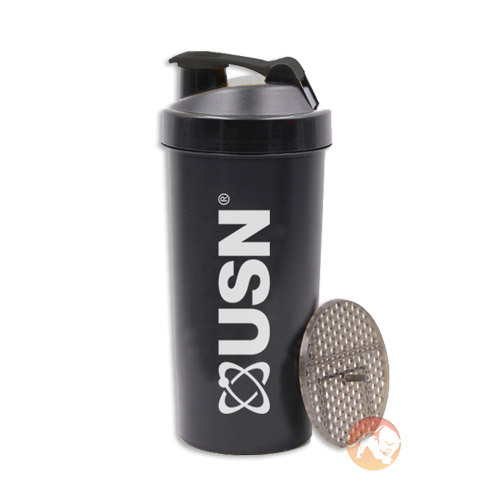 USN Nutrition Mega Shaker features a screw top lid allowing it to stay very tight without any leaking at all. It comes with a pop of top for easy access and convenience. USN Nutrition Mega Shaker also features a mesh mixer inside rather than a wire ball. As you shake, the mesh top will help keep your protein shake clump free. USN Nutrition Mega Shaker is easy to clean too. Take the lid of and clean inside with nice warm soapy water, it’s as easy as that. Anything you’ve had in will wash away. USN Nutrition Mega Shaker is definitely a top choice for those who are wanting big shakes like the USN Muscle Fuel Anabolic. If you don’t use it for shakes, you can store water for the day or at the office. USN Nutrition Mega Shaker is a durable product. It is made from hard plastic and features USN branding down the side, making it looks pretty stylish.